Local prosecutors are now responsible for pursuing cases targeting fuel tax theft after the public integrity unit's motor fuels tax fraud division shuttered last summer, a move that followed state funding cuts. Some are concerned that criminals will see less of a deterrent to fuel tax fraud schemes. Piqued last year over the refusal by the Travis County district attorney, Rosemary Lehmberg, to resign after her drunken driving arrest, Gov. Rick Perry exercised his veto power and withheld more than $7.5 million in state money from her office’s public integrity unit. The unit, whose responsibilities include investigating wrongdoing by state officials, laid off employees as a result. The unit’s insurance fraud and motor fuels tax fraud sections were quietly dissolved last summer. While insurance fraud cases were transferred to other prosecutors, the motor fuels tax fraud division is no more. Fuel tax theft cases now completely fall to district attorneys to prosecute. And the public integrity unit’s chief and former members of the fraud section are concerned that criminals will see less of a deterrent to fuel tax fraud schemes. That is not necessarily true, says Rene Pena, the district attorney for a five-county jurisdiction in the center of the Eagle Ford Shale drilling area — Atascosa, Frio, Karnes, Wilson and LaSalle. “If we receive them from our law enforcement officers and it reaches the probable cause standard,” the cases will be prosecuted, Pena said. Martin Cano, director of criminal investigations at the Texas comptroller’s office, which refers fuel tax investigations, said that some smaller district attorney offices unfamiliar with the field could face a learning curve, but that he did not expect a sudden downturn in enforcement. “The veto affected the public integrity unit, but it didn’t affect compliance,” Cano said. The money at stake is significant. With the state gas tax at 20 cents a gallon, a tanker truck carrying 10,000 gallons is transporting $2,000 in state taxes that help pay for Texas highways and schools. Factor in federal gas taxes, and that tax load worth doubles to about $4,000 in tax receipts. In Texas, a state at the center of the refining industry, motor fuel tax schemes can range from individuals who steal tax-free or red-dyed diesel designated for construction and farming use, to organized rings that import stolen gas from elsewhere, even American military bases and Mexico, while avoiding federal and state taxes. Beth Payan, a prosecutor who spent five years with the now-closed fuels tax fraud team, said one case involved thieves who resold aviation fuel stolen from Fort Bliss in El Paso. Other cases have involved defendants who sold bootlegged concoctions, or “blends” made from Houston Ship Channel sludge mixed with gasoline. The motor vehicle fuel tax fraud section was the integrity unit’s smallest, equipped with a nearly $1 million annual budget to investigate cases anywhere in the state. It had two prosecutors, two forensic auditors and an investigator. According to the most recent statistics available, the state motor fuels section has returned 277 convictions since 1989. More than $12.6 million in restitution was ordered. Depending on the charge, the crimes, which are felonies, can carry a penalty of up to life in prison. Because motor fuel tax fraud cases are often laborious, requiring a lot of surveillance and paperwork, some critics are concerned that the cases will take a back seat to more violent crimes. Since the unit shuttered, 34 motor fuel cases were sent to the comptroller’s office to be passed to district attorneys. Pinpointing how much is lost when fuel taxes are not paid is difficult and has flummoxed government accountants for decades. Most auditors try to estimate the loss through what is sold and taxes that are paid, but considering the exemptions offered to several military groups, school districts, ranchers and the construction industry, it is an arduous task. Federal fuel tax evasion cost the nation’s taxpayers about $1 billion annually in 2001, the latest figure available from the Federal Highway Administration. Fuel tax collection initiatives in the 1990s have helped with enforcement. Since 1994, the nation’s off-road diesel fuel, which is tax-free, has been dyed the hue of red Kool-Aid so regulators can quickly identify whether a driver on the highway has illegally filled up with fuel that is to be used for farm or construction equipment. Ten years after the red-dye initiative, IRS officials issued 900 penalties worth $1.8 billion involving illegal use of dyed fuel. Most of the misuse occurs in the construction or agriculture industry by individuals who fill up their personal vehicles with tax-exempt fuel. But criminals continue to try to capitalize on red-dye diesel, selling it at the full-diesel price without paying taxes at the rate of 44 cents a gallon. More than 3 billion gallons of the tax-exempt red-dyed diesel fuel was sold in Texas in 2013, according to the state comptroller’s office. Ruth-Ellen Gura, who retired from the integrity unit’s motor fuels tax division two years ago, says Texas prosecutors have seen where fuel is bought in Louisiana, for example, marked for export to Mexico (which makes it tax-exempt), and then sold in Texas for the taxed price, but the tax was not forwarded to Austin. “So Louisiana wasn’t collecting the tax and then the buyer was stopping in Texas and selling it to convenience stores,” she recalled. Word that her former unit was shutting down was distressing, she said. “I think it’s terrible because the state is the victim. The citizens of the state are the losers,” Gura said. 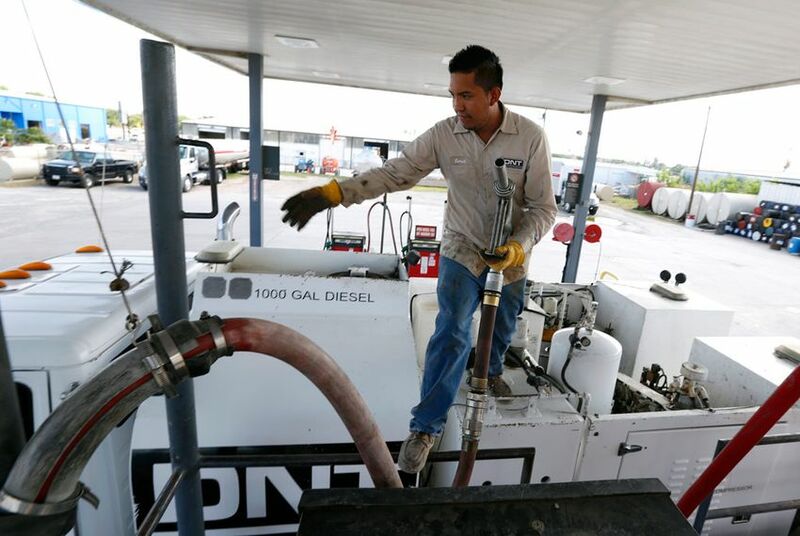 *Correction: A previous version of this story incorrectly reported that more than 3 trillion gallons of red-dyed, tax-free diesel was sold in Texas. It was 3.3 billion gallons.